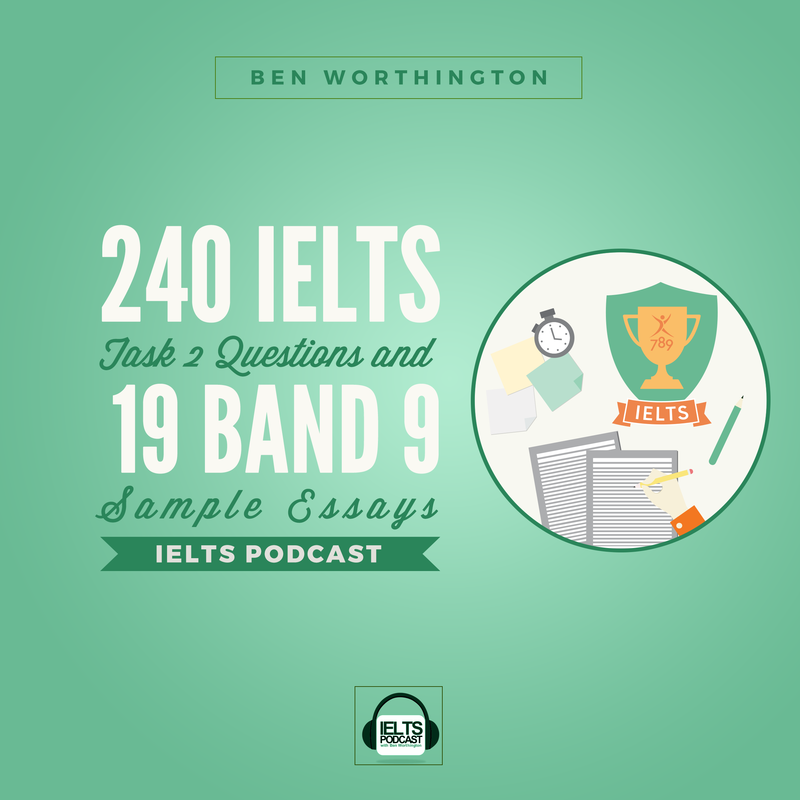 Band 9 Sample answers are useful as study guides – especially for IELTS essay band 9. Having access to previously completed work that you can have confidence in will show you what you are missing! 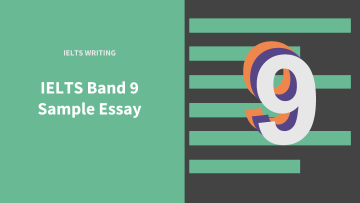 Click here for a full list of Band 9 sample essays. Use the following sample and its explanations to see how close you are to a band 9! Why is this Essay a Band 9? Task Achievement – To what extent does the examinee address all parts of the task with a fully developed position, inclusive of fully extended and well supported ideas? Coherence and Cohesion – Does the examinee logically organise the information and ideas? Is the entire essay cohesive? Lexical Resource – To what extent does the examinee use a wide range of vocabulary with accuracy? Do they demonstrate sophistication regarding the use of lexical items? Grammatical Range and Accuracy – Does the examinee use a range of grammatical structures accurately? The British Council (the administrator of the IELTS) outlines 9 different bands of performance for each of the above dimensions here. Your scores in each of these dimensions are averaged to determine your overall band for your essay. Let’s take a look at an example essay that scored as Band 9 and then we’ll dig into each of these 4 areas to see why it received that score. Doing an enjoyable activity with a child can develop better skills and more creativity than reading. To what extent do you agree? Use reasons and specific examples to explain your answer. Parents throughout the world place spend time reading with their offspring to prepare them for school where their literacy skills are further developed; however, recent research suggests that focusing on reading at an early age can be detrimental, and participating in fun activities would be far more beneficial. I am a strong advocate of this approach, and the benefits of it will be covered in this essay. A fundamental reason for this is that there is no biological age for reading, and pushing infants to acquire this skill before they are ready could have repercussions. For example, in the UK, many boys are reluctant readers, possibly because of being forced to read, and this turned them off reading. By focusing on other activities and developing other skills such as creativity and imagination, when they are ready to read, they usually acquire this skill rapidly. In addition, the importance of encouraging creativity and developing a child’s imagination must be acknowledged. Through play, youngsters develop social and cognitive skills, for example, they are more likely to learn vocabulary through context rather than learning it from a book. Furthermore, play allows youngsters to mature emotionally, and gain self-confidence. There is no scientific research which suggests reading at a young age is essential for a child’s development, moreover, evidence suggests the reverse is true. In Finland, early years’ education focuses on playing. Reading is only encouraged if a child shows and interest in developing this skill. This self-directed approach certainly does not result in Finnish school leavers falling behind their foreign counterparts. In fact, Finland was ranked the sixth best in the world in terms of reading. Despite being a supporter of this non-reading approach, I strongly recommend incorporating bedtime stories into a child’s daily routine. However, reading as a regular daytime activity should be swapped for something which allows the child to develop other skills. Presents a fully developed position in answer to the question with relevant, fully extended and well supported ideas. In order to score well on Task Achievement, the most important thing is to make sure you respond to what is being asked of you. Is the prompt asking for an opinion, a discussion of a problem, a solution to a problem, or some combination of these? If you provide an opinion and not a solution when you’re being asked for a solution, you’re not going to score well in this area. Read the question carefully! The prompt for this essay asks: “To what extent do you agree [with the previous statement]? Use reasons and specific examples to explain your answer.” It wants an opinion – with support! This essay addresses all parts of this task. The opinion is included in the introduction to make the writer’s position clear, and then the following paragraphs support the writer’s position with examples and justifications. Overall, the response is full and relevant and each of the points is detailed and connected to the thesis. Explain your ideas in a logical order so that you don’t need many linking words. This is probably what you do when writing in your own language. Use easy linking words like and, but, also, firstly, secondly, finally, for example. These are so common that they attract almost no attention. This essay does a good job of this – you’ll notice that each paragraph naturally (logically) follows the one prior, providing additional support for the original opinion, and some simple linking words – in addition, furthermore (both paragraph 2) and moreover (paragraph 3) – are used throughout. These are all good discourse markers that show what is coming next adds to the argument and are slightly more sophisticated than firstly, secondly, and thirdly but don’t come across as being forced. The other aspect to scoring high in C&C is ensuring an essay is well-structured. What do I mean by that? A well-structured essay has a good introduction, body paragraphs that are easy to follow and connect with one another, and a good conclusion. Each body paragraph should also have its own topic sentence and support and then smoothly transition to the next paragraph. Our sample essay has a “simple but good” introduction in which it shows that the examinee has knowledge of the topic and clearly states the writer’s position to set up the rest of the essay. The paragraphs all have topic sentences, which are then supported by examples, and are easy to follow. The main body and conclusion relate back to the thesis in the introduction. A note on conclusions… there are two schools of thought when it comes to how to conclude an IELTS essay. One is to conclude with one simple sentence so that you spend more time perfecting your main body paragraphs. The other is to wrap up with two sentences, once which includes a small prediction (ie, how you think things might turn out) as a way to show the examiner that you know how to correctly use another tense (which will help boost your GR&A score – more on that in a minute). Either is fine, just don’t forget your conclusion! Taking time to plan out and organise your response before you start writing is an extremely important step in scoring well in Coherence and Cohesion – make sure you do so to ensure your essay is well structured and reads cohesively when you’re done! Collocations, topic specific vocabulary and phrasal verbs are the name of the game here. To score well, an examinee needs to show that they have a wide-ranging vocabulary and they know how to use it. Our sample essay does a solid job of showing off a range of vocabulary – you’ll notice that while the essay frequently refers to children, the writer employs different vocabulary (infants, youngsters, offspring, counterparts) to do so. Note: it is highly likely that you will need to refer to people/children in your IELTS Writing task, so make sure that you have lots of different words to use to refer to them. IELTS examiners do not like to see the words “people,” “children” over and over again! The same goes for the word “important” – make sure you have plenty of alternative phrases (essential and vital are both used in our sample essay). One note here: students preparing for the IELT S often ask if they should use idioms (like “you’re barking up the wrong tree”) in their essays to further demonstrate their grasp of the language. In my opinion, no, you shouldn’t. Idioms are informal by nature and not appropriate for a written essay of this type. Stick with demonstrating your range of vocabulary and your ability to use phrasal verbs correctly! The final scoring dimension is related to grammar and grammatical structures – do you know them and can you correctly use them? Note that there is nothing in the scoring criteria about including specific tenses or sentence constructions. Your main objective should be to reduce the number of mistakes that you make. An essay that contains no mistakes is likely to get a 9 for grammar, regardless of the types of sentence that it may or may not contain. If there is a nice mix of long and short sentences in your essay, you’ll meet the grammar requirements. Remember, as soon as you write a “long” sentence you are naturally going to use connectives (linking words), which will make the sentence ‘compound’ or ‘complex’. So, don’t think too much about the grammar – just aim to reduce the number of mistakes that you make, and try to include a few longer sentences. 1. Answer what is being asked! Make sure you read the prompt carefully and answer the questions you’re being asked. I can’t emphasise this enough. In order to score well on Task Achievement, you need to appropriately and fully address the task. 2. Plan your work, work your plan. Are there places where you can swap out stronger words for weaker ones in order to improve your Lexical Resource score? Are there places where you can phrase things differently in order to illustrate your Grammatical Range? 4. Where are you falling? Can you plan an effective essay? Quickly? Ideally between 3-5 minutes. Can you think of enough ideas and examples to put in the essay plan? Firstly you need to discover which of these skills you need. To do this you write a lot of essays and then find out which part of the essay writing process is costing you the most amount of time, points or stress. Personally the easiest and fastest way to get these skills is to do an online course specialised in training students with these skills. Here is a good course for that. A lot of students fail the IELTS exam, and end up with 6.5. Also, a lot of students go straight to Google and search for “IELTS Writing tips”, or “Task two tips”. These tips might be helpful but sometimes the real problem might just be in the language skills. You see writing error free perfect sentences is probably much more of challenge than you think, especially under exam conditions i.e in 40 minutes with immense pressure to pass. The fastest way to improve your language skills is to get feedback. Ask someone to review your written work and, you will probably be surprised and disappointed. This is very common. Here is a good service that will review your essays for you and help you improve. The global phenomenon of urbanisation from the beginning of industrialisation to the present day has brought opportunity and prosperity, albeit at a cost in the quality of life. With an increasing city population, the complexity of the challenges also increases, the causes and solutions for this are outlined below. The causes for the decrease in the quality of life are paradoxically the prosperity endowed on such metropolitan centres. Their growth is largely due to the increase of opportunities on offer, which in turn increases their attractiveness, essentially they are trapped in a positive self-reinforcing cycle. However, this eventually leads to a decrease in the quality of life as the city can experience overcrowding, exorbitant property prices, and increased vulnerability to terrorist attacks. For example the density of London makes it a more efficient place to attack, when compared to a smaller city such as Bradford. Therefore, due to continuous growth and prosperity, urban citizens, especially the less well off, often experience a lower standard of living. Considering the solutions, greater investment in public transport would ease traffic congestion, as would bike lanes. In theory this would reduce air pollution, and possibly improve the wellbeing of the population if they did adopt a more active lifestyle and cycle to work. To counter violent terrorist attacks, cities could embark on CCTV installations, so as to closely monitor for threats. For example, it is said, the CCTV in London has foiled many potential attacks, and therefore greatly increased the security of its citizens. To conclude, a wealthy city attracts a large population inflow, which then causes pressure on existing infrastructure and security. Various solutions exist to mitigate such drawbacks, nevertheless an indefinite solution has yet to be found. Social media marketing can influence what consumers buy. Do you agree or disagree? To what extent do you agree? Since the introduction of social media applications in the early 2000’s the world has become a much smaller place. Social media applications such as Facebook, Instagram and Twitter have become information sources for a majority of the global market. As such, I would agree that marketing, which happens to be a source of information accessible on these platforms can influence the consumers who use them. This notion is further aided by the rise in online retail stores who conduct the bulk of their transactions online. This makes it easier for the consumer to purchase from anywhere in the world. As a consumer on social media, you are constantly bombarded with advertisements of various products that are specifically designed to catch your attention. This means that most of the adverts on your news feeds aren’t random and will almost always feature something you have previously searched online or something currently popular or trending. Given the fact that most social media users are young consumers who are influenced by current trends and happenings these adverts will almost always catch their eye. The habit of sharing, retweeting and liking also ensures that these adverts get around, quite fast. As such, when an advert does reach your news feed you have already probably seen it on your friend’s news feed. The truth is, adverts are a form of information and with the age of the internet, information spreads faster than a wild fire. Therefore, it only makes sense that in the era and age of technology, globalization and the need to be trendy, social media marketing can influence what consumers buy. Various solutions exist to mitigate such drawbacks, nevertheless an indefinite solution has yet to be found. A myriad of partial fixes exist for these issues, yet a permanent solution is still out of reach. There are many methods employed to quell this flow of people, but still a reliable solution has not been discovered. The modern urban environment varies considerably depending on both the city that produces it and the individual who perceives it; Each experiencing a unique blend of at least some economic success, varying degrees of localised or wider deprivation and periods of growth and decline. Environmental factors permitting, a city will provide well for its citizens as long as it can properly manage the execution of social policy. Globalisation presents many challenges for those responsible for policy as large inflows of people are to be expected in a place of success and therefore opportunity; The ensuing mixing of cultures has far-reaching social consequences that can affect how the city is both presented and perceived. 1a. To become aware of (something) directly through any of the senses, especially sight or hearing: We could perceive three figures in the fog. 1b. To cause or allow the mind to become aware of (a stimulus): The ear perceives sounds. 2. To achieve understanding of; apprehend: Einstein perceived that energy and matter are equivalent. 3. To regard or consider; deem: an old technology that is still perceived as useful; a politician who is perceived to be untrustworthy. 1. The/an act or an instance of depriving; Loss. 2. The state of being deprived: social deprivation; a cycle of deprivation and violence. There are many more writing samples for you to explore. The BBC has great pages on discursive writing and general writing, also, this video is good for learning how to give examples. You can even read a sample Harvard essay aimed at preparing students for academic writing. Select a text that is appropriate for your level. Choosing the wrong text can result in a loss of confidence and feeling bad never helped anyone to learn anything quickly! Listen to the IELTS Essay in a Song! If you are looking to boost your Lexical Resource (25% of the IDP marking criteria! ), then check out this tutorial all about IELTS vocabulary. Sample essays for writing task two can be found here, and sample letters for the general module can be found on this page. Alternatively you may be searching for some sample diagrams for the academic component, this page has pie charts, line graphs, and bar charts, try writing a few answers. If you are looking for help on how to start IELTS Writing Task 2 – there is a valuable video in this post. NEED TO PASS IELTS FAST? Or just tired of taking the exam too many times? Have a look at this special online course that helps you improve both your IELTS exam skills and English language skills. Alternatively, you may just need to work on your grammatical range and accuracy, so an essay correction will help you identify your errors so you don’t make them again. This site offers economical essay corrections. Use these useful sentences for Writing Task Two. This page is good for sample topics and answers, also for Task Two. The writing part of your IELTS exam is a great place to score some extra points, especially if you are looking to score within band 8. Here is a task 2 writing sample to help you do just that. Vocabulary is probably the most important part of preparing successfully for IELTS. It is used for both the speaking and writing part of the exam. Click here to view some essential vocabulary. The ILETS exam have a number of general essay topics that span a number of disciplines ad subject matters. To have an idea of what to expect check out our list of general essay topics. Yes, you have to send a copy of your certificate showing your 6.5 score in Writing to be able to qualify for the guarantee. It doesn’t matter if it’s the GT or AT. The online course has modules for both. The quality of life in large cities is decreasing. If something is not done to combat this issue, the quality of life will continue on decreasing. More and more people move into large cities in order to avail the facilities which smaller cities don’t provide as much. Larger cities have more job opportunities for people,and provide more health care facilities, more educational facilities, and more entertainment. However, as more people start moving into large cities, the demands of people start to outweigh the supply. In Dubai, where I live, for example, so many people had moved into the city last year that there were more people and less housing units to facilitate them. When the demand becomes more than the supply, the price of everything starts to rise. Therfore, the rents started to reach the peaks. This forced people who wernt able to afford the skyrocketing rents to move into smaller and cheaper apartments, or to go on sharing apartments with one or more families. Supply demand imbalance has also caused food to become more expensive, forcing people to go for alternative, cheaper products of lower quality. Find synonyms of common words. In your essay, the word “more” is spewn-out in an inordinate amount. Consider changing the length of sentences. Concise, then lengthy:Add variety. Use formal English. Specifically, use ‘were not’ instead of weren’t. These are just basic fundamental tips to add flair to your writing and to make you appear well-versed, but they might do wonders for your writing score. I had a question related to third paragraph. Considering the solutions,greater investment in public transport will ease traffic congestion, as will bike lanes.In theory this will reduce air pollution and possibly improve the well-being of the population if they will adopt a more active lifestyle. You can write “Considering the solutions,greater investment in public transport will ease traffic congestion, as will bike lanes. – Is ok but the original sounds better because it’s all hypothetical. In theory this will reduce air pollution and possibly improve the well-being of the population if they will adopt a more active lifestyle. Is a conditional sentence, so it needs “DID”, not WILL. Practice, practice, practice. Also get some feedback. It is a wonderful essay. I think it is difficult to reach. Thanks to the poster . It is a wonderful essay. I think it is difficult to reach. Thank u to the poster . … emdowed with or endowed on? this essay is absolutely unreachable! I felt the same as Gustavo…I couldn’t get a 9 even in Portuguese, my native language. But I’ll keep on taking notes of important words to use on the essay. Write no of words in brake. Great balanced essay. Well wrìtten but i would give 8.0 for this essay. Thanks for share it Ben! Why did the last sentence use the word “indefinite” instead of “definite”? May anyone give me an explanation? Thanks.